Thomas Stephen Tuohy was born in Woodforde, Ireland on November 20, 1852. He came to South Australia with his parents on the Navarino, which arrived in Port Adelaide on 16 July 1857. When the ship arrived in Port Adelaide, she was discovered to be manned by the immigrants owing to a serious mutiny which had taken place amongst the crew, seven of whom were in irons. T.S. Tuohy was only a child at the time; perhaps this dramatic experience affected his future career! His family settled at Hindmarsh and Mr Tuohy’s education began at the first Roman Catholic school established in the district. He completed his formal education at St Patrick’s, West Terrace. After an initial period where he tried his hand at farming in Gulnare and Crystal Brooke, he returned to Adelaide in 1874 and joined the mounted police. After his four months training, he was posted to Two Wells as an assistant trooper. He rose steadily in the Police and opened a new station at Mallala. Nine days after his arrival, he married Miss Mary Gertrude Delaney of Gawler. Their first son was born in Gawler in 1880. After 5 years at Mallala, where he and Mary had another son, Mr Tuohy was transferred to Willunga where he, Mary and their 8 children remained for 15 years, living on the premises of the Courthouse and Police Station. Constable Tuohy’s career in Willunga was distinguished by two dramatic events in South Australian history. Firstly in 1886, he helped investigate the Yankalilla Bank Robbery, where malefactors broke into the premises of the Yankalilla Bank Manager, tied him up and robbed the bank. Two years later, in 1888, Constable Tuohy displayed tremendous courage rescuing people from the Star of Greece shipwreck. 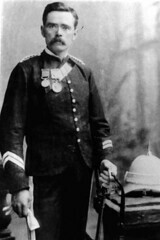 As a result of his actions, Constable Tuohy was awarded medals for bravery. In 1898, he went to Tanunda for 8 years, and then was appointed as barrack-master at the Adelaide Barracks, and then sub-inspector. At his own request, he was then placed in charge of Clare station where he remained for 10 years. His duties here included those of the clerk of the licensing bench, clerk and bailiff of the court, and district registrar of births, deaths and marriages. Constable Tuohy was promoted to the rank of Sub-Inspector in May 1917, and, with two other Sub-Inspectors, was in charge of the Central District for 2 years. He retired in 1919. Thomas Stephen Tuohy died at his home in Kent Town in 1935 at the age of 84, survived by Mary and six remaining children. Two of his children predeceased him. 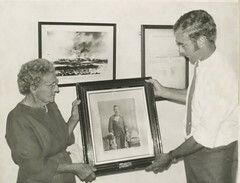 Presentation of photograph of M. C. Thomas Tuohy, 1972. Do you remember Tuohy Thomas Stephen ? Then Join up and add your memory here.